Cook County Commissioner Jeff Tobolski, Commissioner Sean Morrison, and Commissioner Richard Boykin cohosted a program specifically for high school students called “In The Blink of an Eye,” a unique program for students on the impact and consequences of decision making, late March. The program was held at the McCook Athletic and Exposition (MAX) located in the Village of McCook. “Educating our children about the dangers of drugs helps to raise awareness and plays a vital role in addressing drug abuse prevention,” said Commissioner Jeff Tobolski. “I am happy to support this initiative and look forward to working with Commissioners Morrison and Boykin on this important issue at the County.” Denver Broncos Super Bowl Champion Mike Schofield, who is the son of Orland Fire Protection District Chief Michael Schofield, spoke to the students in attendance on the importance of making the right decisions and the impact of those decisions on their young lives. 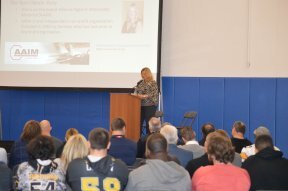 The presentations focused on the extreme dangers of drug use, specifically the heroin epidemic, which has affected many students throughout the country. Students also heard about the dangerous risk of texting and driving, which has had the same negative impact as drinking and driving. (Left to right) Commissioner Jeff Tobolski, Commissioner Sean Morrison, Tami O’Brien, Jason O’Brien, Fire Chief Mike Schofield, Brian Kirk, John Roberts, Denver Lineman Mike Schofield, Andrew Holmes, Curtis Randle El and Joe Nuzzo.